Have you noticed how difficult it is to find fish (salmon in particular) that isn’t farmed? There are many schools of thought on farmed fish – on whether it offers the nutritional benefits of wild fish, on the ethics of fish farms, on what the fish are fed and how they are raised, on the levels of contaminants in farmed fish – it can be difficult to know what the best option is. 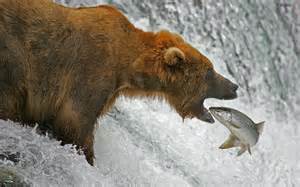 The mere thought of a trillion salmon all jam packed into a net, being fed pellets, turns me right off I have to say! I thought it worth a look into the research to find some further clarity on this…. In an ideal world, I would live near the sea and have access to beautiful line-caught wild fish….that would be nice, but I don’t. For a health-conscious foodie, this leaves me only with the option of hunting down the best quality seafood that I can, and I try to do my best. So…..lesson here? Eat less of these big fellas. These fish species often contain heavy metal contaminants and higher mercury levels in any case, so for me, this is a no brainer. But what about that pesky salmon that I love to cook and eat at least once a week in every which way possible? How does fish that has been bred and “aquaculturally” raised compare to wild fish in terms of the nutritional profile? * Total fatty acid content of the fish – seems many studies (including this one) suggest that farmed fish actually have higher overall levels of fatty acids. This is a good thing, so a big tick there for farmed fish! * Ratio of omega 6 to omega 3 fatty acids – ideally we want a higher presence of omega 3 fatty acids to omega 6 fatty acids. Omega 6 fatty acids can promote inflammation in the body, and it is said that the western diet is higher in Omega 6 than Omega 3 FAs, contributing to the growing emergence of inflammatory conditions in our population. The omega 6/3 ratio in farmed fish is highly dependent on what the fish have been fed. Some studies suggest that farmed fish have higher levels of omega 6 fatty acids than in wild fish, but again, this depends on the feed. A small tick for wild fish here. * Type of feed – some farmed fish are fed marine based feed (fishmeal and fish oils from smaller fish), some are fed vegetable based feed (vegetable proteins and oils) and some a mix of the two. This is probably the single most important determinant of the nutritional profile of the fish, influencing both total fatty acid content and omega 6/3 ratio. * Levels of α-tocopherol – found to be higher in farmed fish, this is a form of Vitamin E that is very favourably absorbed in humans (check out this study for more info). Vitamin E is a powerful antioxidant that not only fights free radicals in the body but is involved in many metabolic processes and in immune function. So this is a big tick for farmed fish! What the fish are fed is super crucial! One study that I read found that linoleic, α-linolenic, and arachidonic acids were significantly higher in the farmed salmon, thought to be a result of the diet of the fish which contained vegetable oils (as opposed to marine based feed). Traditionally ‘aquafeed’ has consisted of marine based feed composed of fishmeal and fish oils, favoured for it’s nutritional quality and price. There is currently a push away from marine based feed however, due to the further environmental strain that sourcing the marine feeds is placing on our fish supply, and also cost pressures. The industry is moving toward vegetable based feed, composed of vegetable based proteins and oils….but the question is how does this effect the nutritional quality of the fish? Studies suggest that the move toward using vegetable based feed may be producing fish with lower levels of omega-3 fatty acids, so this practice would probably not be preferable from a nutritional perspective in my mind. It is all pretty complex with ‘Farmed vs. Wild Fish’ to be honest, and as the consumption of farmed fish continues to rapidly increase we are only just starting to understand how these aquaculture practices actually affect the fish from a nutritional perspective. We are learning as we go. Just like the rest of us, I basically want it all. I want high quality fresh seafood that I can trust has been produced in a manner that is not only environmentally friendly, but has been ethically treated and maintains the highest nutritional profile possible. Oh and at a reasonable price. And available at anytime. I don’t think there is a straight answer to which is best, and until there is, for me it is about making an informed decision and keeping an eye on the research as it emerges. This entry was tagged aquaculture, Australia, farmedfish, overfishing, salmon, trout. Bookmark the permalink. ← Who said pizza had to be unhealthy?